The Winter edition of the South Euclid Lyndhurst Schools production of the “Arc Pride,” will soon be in mailboxes throughout the community and the District encourages everyone to keep an eye out for this publication. Inside, citizens will learn about the efforts to continue enhancing communications in the District, a few major academic milestones that were achieved by several students, updates from the buildings and other valuable news. 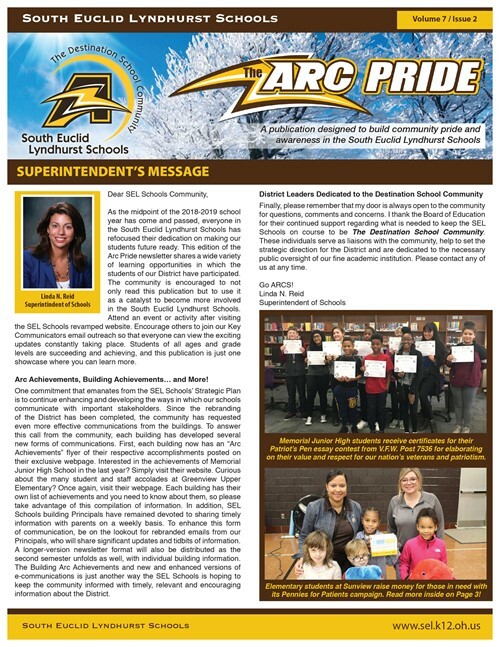 The Arc Pride newsletter is designed to be a regular form of communication that the community can review at their own leisure and understand the successes taking place in the South Euclid Lyndhurst Schools. The District’s friends online can view a copy of the latest Arc Pride Newsletter by clicking the link nearby. Thank you for your continued support of the South Euclid Lyndhurst Schools. Go Arcs!